Emily is currently a High School teacher in Halifax, Nova Scotia. 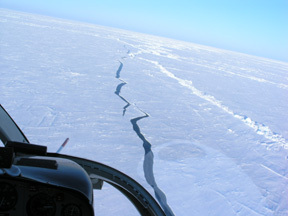 Climate change is one of the key disturbances for species dependent on ice,4 and there is increasing evidence that ice extent, concentration, thickness, and ice season duration have all declined significantly since the 1960s.5 Polar bears living at more southern latitudes, such as those in the Hudson Bay region, may be affected sooner and more severely by these changes. The bears of western Hudson Bay live and hunt on the sea ice from November to July, and are forced ashore each summer as the ice melts. They tend to show strong site fidelity when returning to land and while off the ice they survive almost entirely on their fat reserves.6 The ice season in Hudson Bay has become shorter over the last three decades, meaning there is less time for polar bears to hunt and accumulate fat, and this has resulted in bears coming off the ice in poorer condition.7 As ice continues to change in Hudson Bay, it is important to understand how polar bears may be affected. 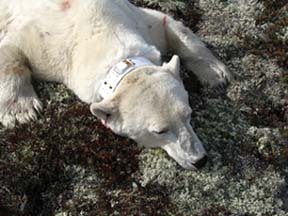 There are two factors that make Hudson Bay unique as a habitat for polar bears: 1. It is an inland sea, almost entirely enclosed by land unlike most of the Arctic, and 2. it becomes ice-free each summer, so that bears are forced back to land, and this means that near break-up, bears may be balancing foraging needs with the need to move toward shore. The goal of my research was to quantify the relationship between variations in sea ice and polar bear distribution in western Hudson Bay. I had three main research questions. 1. Are the seasonal home range sizes, movement rates, and mean directions of movement of polar bears on the ice of Hudson Bay related to sea ice characteristics? How do these space-use strategies of Hudson Bay polar bears compare to those of bears in other Arctic populations? 2. How do variations in several habitat characteristics such as ice concentration and stage of development, floe size, and bathymetry influence polar bear habitat selection on Hudson Bay? How does polar bear habitat selection in Hudson Bay compare to habitat selection in other Arctic regions? 3. Have movement patterns or habitat selection changed over the past decade? I addressed these questions using data from bears fitted with satellite collars between 1991 and 1998 combined with new data from bears collared in September 2004. I analysed the location data along with data on ice conditions from the years of interest in a Geographic Information System (GIS). Advances in both GPS-satellite collar technology and GIS technology make it possible to look in detail at what bears are doing out on the ice. The results of this study help us better understand how polar bears in Hudson Bay are affected by variations in ice condition, and how these bears may differ from high Arctic bears in their habitat selection strategies. This can provide insight into what drives polar bear movement patterns and distribution. In addition, models of habitat selection will allow researchers to predict polar bear distribution on the Bay given specific ice conditions, which will help researchers predict how the local ecosystem may be altered as the global climate changes. 1. Lunn NJ, Schliebe S, Born EW. (comps. and eds.) 2002. Polar Bears: Proceedings of the 13th Working Meeting of the IUCN/SSC Polar Bear Specialist Group, Nuuk, Greenland. IUCN, Gland, Switzerland and Cambridge, UK. 2. Smith TG. 1980. Polar bear predation of ringed and bearded seals in the land-fast sea ice habitat. Can. J. Zool. 58:2201-2209. 3. Ramsay MA, Stirling I. 1988. Reproductive biology and ecology of female polar bears (Ursus maritimus). J. Zool. 214:601-634. 4. Stirling I, Derocher AE. 1993. 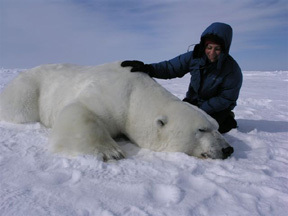 Possible impacts of climatic warming on polar bears. Arctic 46: 240-245. 5. Parkinson CL, Cavalieri DJ, Gloersen P, Zwally HJ, Comiso J. 1999. Arctic sea ice extents, areas, and trends, 1978-1996. J. Geophys. Res. 104:20837-20856. 6. Stirling I, Jonkel C, Smith P, Robertson R, Cross D. 1977. The ecology of the polar bear (Ursus maritimus) along the western coast of Hudson Bay. Can. Wildl. Serv. Occas. Paper No. 33. 7. Stirling I, Lunn NJ, Iacozza J. 1999. Long-term trends in the population ecology of polar bears in western Hudson Bay. Arctic 52:294-306.